On Monday Edward L (RC) took great pride in reading some of his first words to me in my study, for which he was rewarded by Mrs Curtis with a Headmaster's Commendation. It was a joy to see Edward's pride. There have been other Commendations, the source of equal pride: for impressive discursive and creative writing, for beautifully presented and clear booklets on mathematical formulae, for maps of Thermopylae, creative similes, for kindness and care and, interestingly, one for 'trying porridge for breakfast and working hard'. Such is the variety of achievements for which the children are rewarded here. I have also thoroughly enjoyed hearing about recent trips to Dorset, Normandy and Spain from which our children clearly gained a great deal as well as having enormous fun. There is more about these trips within the Newsletter, and some lovely photographs on the website. Perhaps my biggest highlight this week has been the presentations of three boys in Year 7 who have researched the fascinating experiences of relatives during World War Two. All three boys have gained rich rewards from their research and from talking to some of the very few who still remember such events. They will be presenting their ideas in Assembly on Monday. If I gain permission, I will publish their stories in forthcoming Newsletters – they are extremely moving. The children were fortunate enough yesterday to listen to a wonderful presentation in Assembly by Mr Stead. He spoke about well-being, and it is of course the well-being of the children here which is at the heart of all that we do. 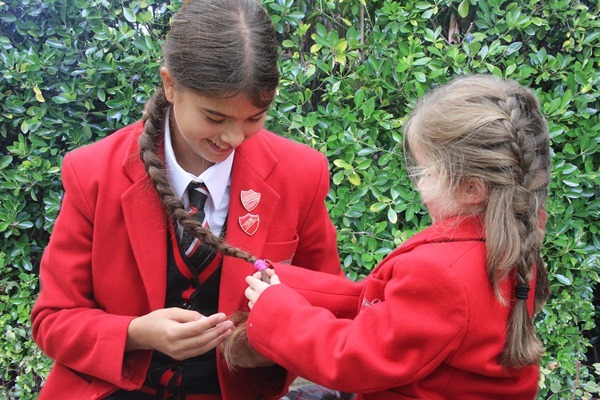 Above all else we want the children at St Christopher's to be safe and happy and to be confident enough to be the very best versions of themselves that they can be. Mr Stead reinforced to the children how important it is for them to respect and understand each other, for them to develop the clear sense of right and wrong which will enable them to make the right choices and for them to learn to appreciate their world and the people in it. At the end of the Assembly the children were asked to sit absolutely silently and think about a place of beauty which they knew well. Just as the noise of children playing at school is joyous, there is a beauty in silence and the children in Assembly this morning fully appreciated that. It was lovely to see so many of you at St Philip's at the beginning of this week for our Harvest Festival Service, and I would like to thank you and your children for bringing in to school food which is now with those living in Brighton and Hove who most need it. As half term approaches and autumnal rain and wind replace very suddenly the golden sunshine of September, I can reflect on the first half of term with great pride in the children at the school who have achieved so much in class, on the games field, on stage and in so many other areas of school life. Most are tired and ready for a rest and so I wish them all a very happy half term. 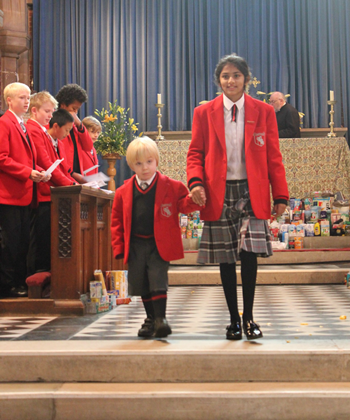 Our oldest and youngest pupils make the donation at Harvest Festival. I am very keen that the pupils at St Christopher's develop an interest in what is happening in the world around them, one reason why we have introduced a new forty minute lesson for Year 7 and 8 before lunch on Wednesday called 'My World'. 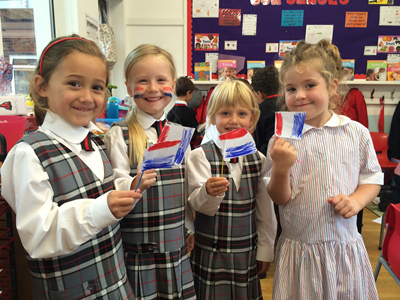 We have spent time focussing on the Scottish Referendum and its likely impact, and I was very impressed by the enthusiastic and considered response from our older pupils. Recently we have looked at events which shaped the last century and we are now going on to consider events and developments which might shape the 21st Century. Put into small groups pupils raised a number of ideas including a rising population, climate change, the rapid development of technology and its impact, the possible escalation of conflicts in Eastern Europe, Syria and the Middle East, and dwindling world resources, impressing once again with their ability to think independently. I am also very keen to raise the awareness of all of our pupils of the plight of people, especially children, in areas where there is great despair and equal need. At present there are over 4.4 million refugees in Syria and Iraq, many of them children, and there is a way in which you might wish to support those children as winter approaches. I have included details of the aid which is being provided by a local charity. I hope that there will be St Christopher's parents with unwanted children's clothes (which are still in good condition) who might want to bring them to the school over the coming four days. We will ensure that prefects or teachers at the gates in the morning are able to receive donations of clothing and store them for transport to the local clothing depot. I am lucky enough to have an office which looks out directly onto the playground. As I write Year One are joyfully engaged in PE exercises which give them an outlet for their natural energy but also develop the balance, speed and coordination, so important to their physical development and enjoyment of sport. It has been another busy and successful week for our footballers and for our hockey players and there are tournaments to look forward to today and on Saturday which I hope many parents will have the opportunity to support; that support is hugely appreciated by the children and their coaches. Trips also play a vital part in the curriculum here. A lot of the work the children present to me for Headmaster's Commendations has been inspired by a visit to a castle, the beach or a museum because such trips fire both their interest and their imagination. Yesterday, Year 7 pupils visited Warren Woods to look at different woodlands and consider biodiversity and Year 2 have just come back excited by their science trip to Pizza Express. On Monday Ancient Egypt Day built on the work the children have been doing in Year 3 and they arrived looking magnificently Ancient Egyptian in their costumes and wonderful necklaces, of which there are pictures within. I am afraid that, splendid though they looked, Mr Stead, looking more pharaoh than the pharaohs themselves and Miss Bentham, adorned as Cleopatra, stole the show. Finally, I thank all those of you who have brought in clothes for the children of Iraq and Syria who have been displaced and are homeless as their winter approaches. The school will be taking the clothing to the depot today from whence it will be transported to Iraq where it will make an enormous difference to a few of the many children in desperate need. Choirs entertain visitors on Open Morning. It has been a very busy week of sport. There was a wonderfully competitive football fixture against BCPS, in which all of the 105 boys playing acquitted themselves extremely well, striving not just to win but to play the 'beautiful' game as it should be played. Our Under 9A footballers followed the lead by playing some very attractive football in the Westbourne House Tournament, coming runners up and our youngest girls were very successful in their netball matches against Burgess Hill High School. Children have been coming to my study in hordes this morning to show me work which has been awarded a Headmaster's Commendation: there were structured poems resulting from Year One's visit to the beach, self-portraits, almost faultless maths which showed that Year Two are developing a very good grasp of coins and their value and some terrific work by the older pupils across a whole range of subjects. 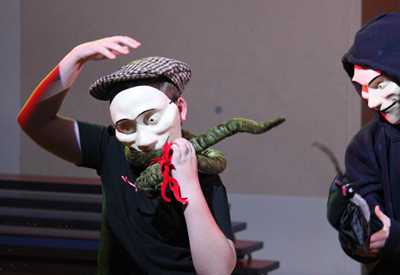 As I write, I am thoroughly looking forward to the LAMDA Evening tonight, which will give children of all ages a chance to perform to an audience and develop the confidence which should be the central aim of all prep school drama. A number of parents have very kindly commented on how useful they found the Lower School Parents' Forum, and I do hope that the Forum for parents of Middle and Upper School will be equally useful. I look forward to welcoming as many of you as possible to the school on Monday evening. I would not be so rash as to suggest that the ideas and suggestions of every parent can be put into action, but I am always very keen to listen to the parent voice which plays an important part in informing policy.